1) Rye sourdough, with dried lavender. Lavender adds a subtle herby fragrance to flavor profile. -Mix flour, dried lavender, icewater, and autolyse for 12 hours. 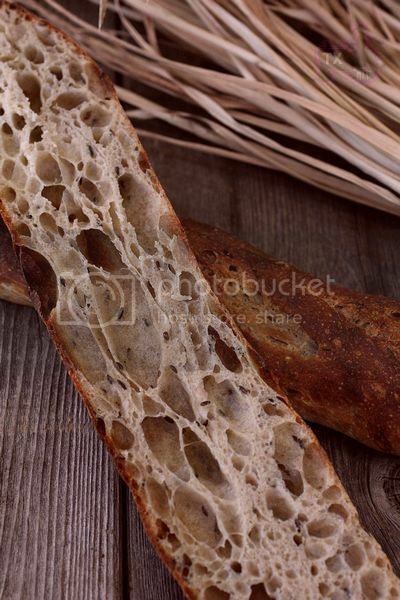 -Mix in salt, starte, then follow the basic 36 hour sourdough baguette formula here. 2)Rye sourdough, with caraway seeds. Such a classic combo, can't believe I just got to it now. -Mix flour, caraway seeds, icewater, and autolyse for 12 hours. 3)Rye sourdough, with millet for extra crunch and nutrition. - Mix flour, drained millet, icewater, and autolyse for 12 hours. 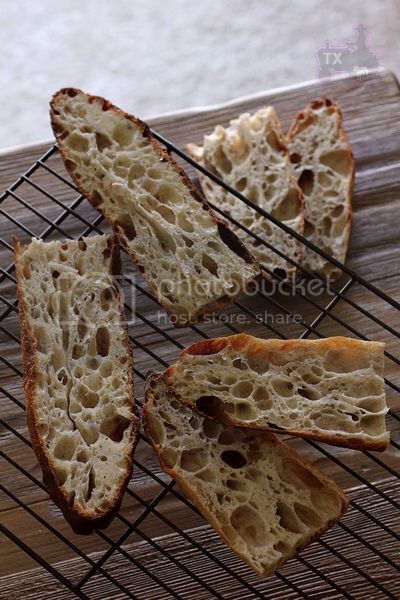 - Mix in salt, starte, then follow the basic 36 hour sourdough baguette formula here. 4) White starter, 20% spelt flour. 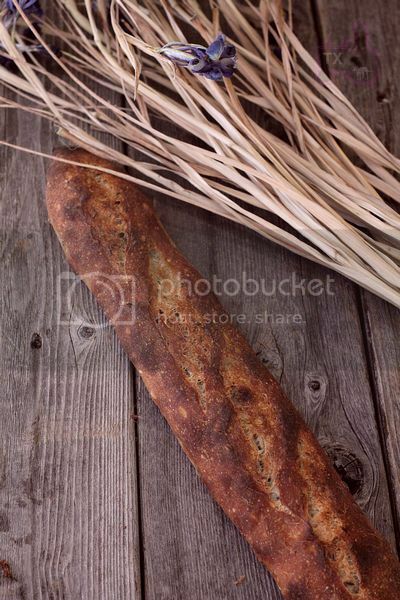 Extra earthy flavor from spelt. - Mix ap, spelt, icewater, and autolyse for 12 hours. Thanks Floyd! Cant wait for the conference! Thanks David, long time no "see"! 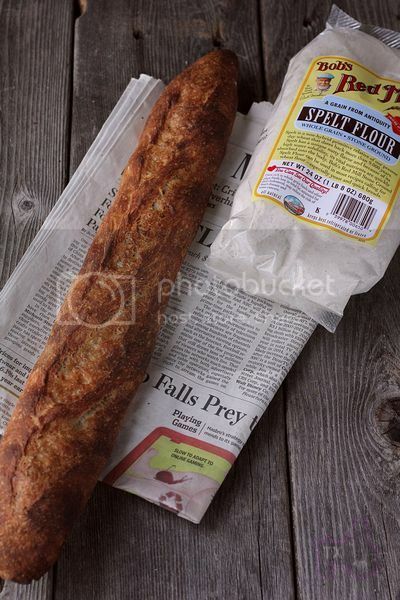 For crust lovers, theses baguettes must be the pinnacle of breads, Txfarmer! It comes in flavors now..?! How extraordinary. Really beautiful, as Floyd said. I agree that these baguettes are mostly crusts, yum! 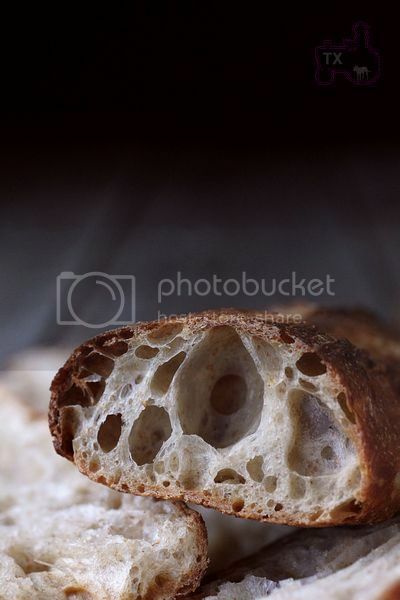 The open crumb is gorgeous. I just can't keep my eyes off it! 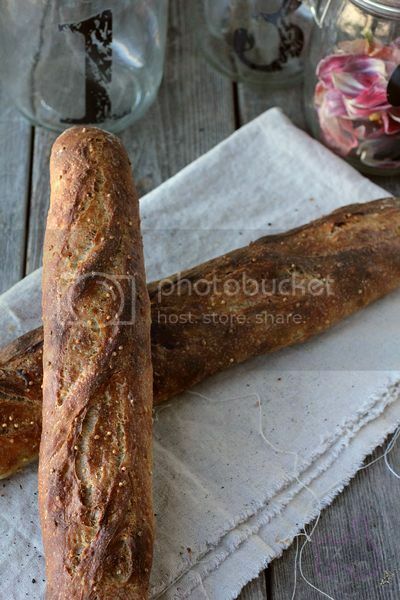 You certainly have mastered this 36-hour baguette being able to give us four variations all of which are consistently stunning. 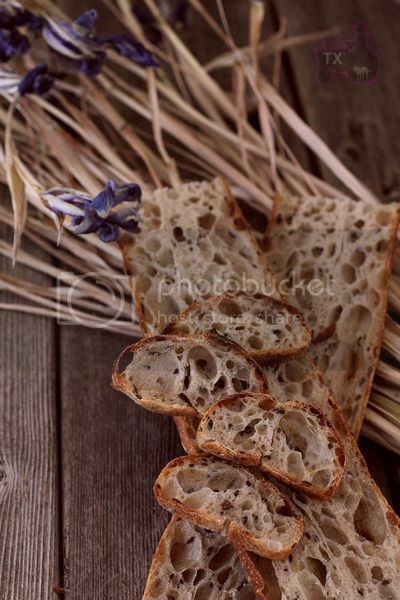 Great flavours, great crumb on each and wonderful photography to boot. Good show - thanks for sharing. What an eyeful. 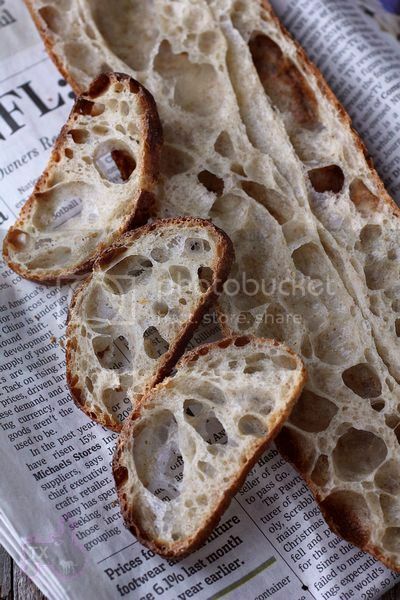 Sets the standard for "open crumb", and perhaps for bold crust on a baguette. Love the darker toastiness of these compared to your more golden 36h bags. And the quality of the photography is, as always, right up there with that of the subject matter. 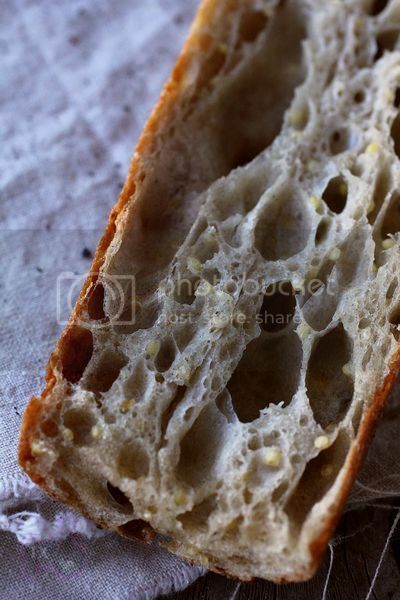 What I have trouble understanding is how you can hack apart these beautiful loaves for the photo shoot, thus opening up that exquisite crumb to staling. I mean, the whole longitudinal slice - big sandwich? Big family? I hope so! Anyway, thanks for doing so for us! 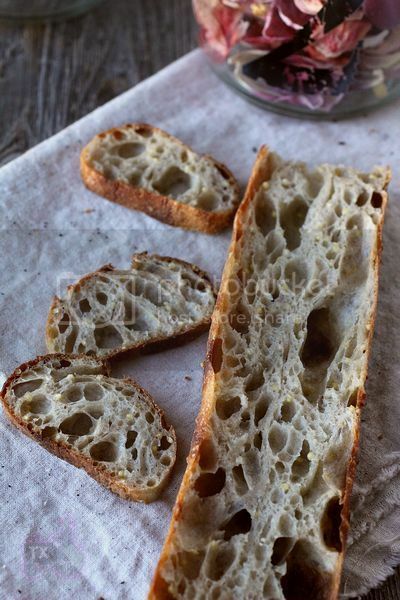 My husband and I can each eath one whole baguette in one sitting, so these cut ones are usually consumed right away. If there are any won't be eaten within 24 hours, I freeze and reheat before eating. What kind of oven are you baking in, what temp, and are you able to keep a nice crispy crust on your bread? A normal electrical oven in my apartment, the baking procedure and temp can be found from the link to the original 36 hour baguette formula. essentially it's preheated with a stone with highest possiblel temp, bake at 460F for 25min. With steam for the first 10. 100th (not really but it seems like it) 36 hr baggies variation. Every Time I put lavender in something one of the girls complains about the taste - its like some folks think cilantro tastes like soap. Lavender can be pungent. 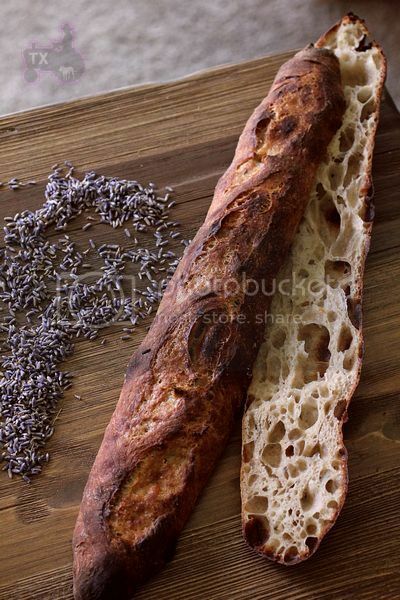 Never tried lavender in bread. Love the spelt and rye in the other two also. Both make plain old white bread better - even in small amounts. makes all the difference. Nice baking and post as usual. Yeah, baking with lavender is tricky, sometimes it's too floral. 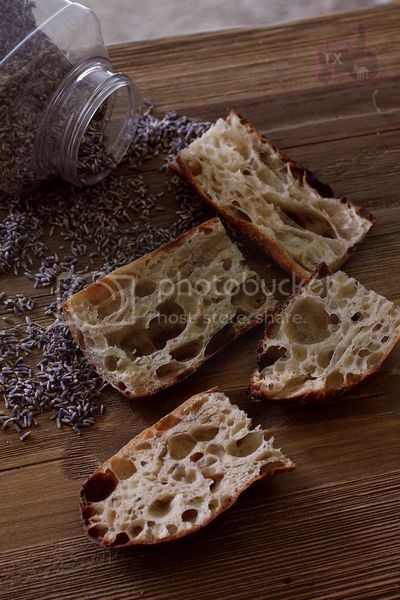 However, kneaded into bread dough, most spice taste milder, lavender is no exception in this case. Another combo I like in tarts/cakes is dark chocolate and lavender, the bitterness of chocolate seems to complement lavender well. Hi txfarmer, thanks for lovely pictures, a visual feast. Super thin crust along with the deep crust color, Wow. Amazing baguettes Txfarmer. You and Dave have these down to perfection. I tried this once and my results were not quite there yet, but after you have reminded me how beautiful and tasty they can be I will have to try again. The last time I had an unfortunate incident while trying to transfer the rested baguettes from my couche to the oven and ended up with several disfigured breads. Needless to say you have inspired me to try again! You're able to bake constant perfect baguettes, I need to make more baguettes and maybe one day I can too. What a beautiful open crumb. I just posted my first baguettes, and of course are hooked on trying to achieve what you have done here. I love your sourdough recipe so much. When I was making mine I was kind of bummed about going back to commercial yeast, and left wondering what they would be like the sourdough way. Also having my starter (Bubbles) just sitting there feeling abandoned. I felt so bad! So thank you so much for inspiring me to use my starter. I will post pictures and let you know how they went. Question: Why the ice water and the 12 hour autolyse?? The ice water slows down the fermentation and allows the maximum flavor development between the flour and starter. I thought that the 12 hour cold autolyse and the 24hr bulk ferment already did this. Plus I thought that around 2 hours is the most you could benefit from autolysing? If not, fill me in on the details!! Thanks for the info on Empress Ying. Hopefully I can do her baguettes justice, or I fear my punishment of a beheading from the daughter of Ming the Merciless herself.